Here's what you need to know about standard spray, upright/pendent, sidewall, extended coverage, and quick-response fire sprinkler systems. Sprinklers vary in many aspects, including installation orientation, design approaches, hazards protected, orifice size, temperature ratings, and response time. Standard spray, upright/pendent. In a typical commercial building, most installed sprinklers fall into the category of standard spray sprinklers, which is defined by the discharge pattern of water. Upright sprinklers are installed with deflectors above the sprinkler, while pendent sprinklers have deflectors below the sprinklers. Common industry practice is to use upright sprinklers in areas without finished ceilings and pendent sprinklers in areas with finished ceilings. There are also recessed pendent and concealed pendent sprinklers. 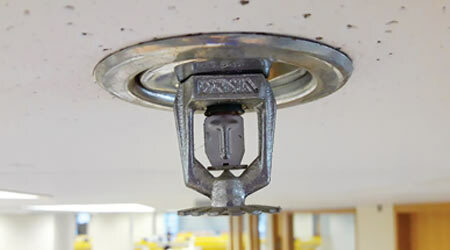 Recessed pendent sprinklers are installed with the body of the sprinkler partially recessed in the ceiling surface; with concealed pendent sprinklers, the body of the sprinkler is completely hidden above a cover plate. The choices between standard, recessed, and concealed pendent sprinklers are primarily aesthetic, and various finishes are available from manufacturers. Sidewall. Sidewall sprinklers are normally used when sprinkler installation in the ceiling is not feasible due to compartment geometry or other issues. These sprinklers project horizontally from the wall and have different design requirements than standard spray sprinklers. The main considerations are the difficulty concealing piping in walls and the limited occupancies that may be protected with sidewall sprinklers. Extended coverage. Extended coverage sprinklers are specifically tested and listed to provide similar fire control performance to standard sprinklers when spaced farther apart. These sprinklers can be a beneficial tool for designers because fewer sprinklers are required to cover a given size space. However, installation and hydraulic requirements are more demanding for extended coverage sprinklers, and costs are higher. Quick-response. In a quick-response sprinkler, the thermal operating element operates faster than the one in a standard sprinkler, allowing the discharge of water earlier in the fire’s growth. The primary benefits are an increase in the level of life safety and property protection and a decrease in the hydraulic demand requirements. For standard light hazard occupancies, quick-response sprinklers have become widely specified as their drawbacks are minimal. In-rack, control mode density area, control mode specific application, and early suppression fast response sprinklers are specific to the protection of high-piled storage and are normally installed in large warehouse-type buildings with a high level of combustible fuel loading. For more about these types of sprinklers, see this Building Operating Management article. Clearly, there are a wide variety of sprinkler systems and types in the marketplace today. Considerations to keep at the forefront when engaging in design discussions are the intended use of the space, the desire for future flexibility in occupancy, the value of the assets protected, and the environment of the system. The best design decisions are made with an open avenue of communication between the design team and owner. Scott Knight (sknight@jensenhughes.com), EIT, is an associate fire protection engineer with JENSEN HUGHES. Chris Moran (cmoran@jensenhughes.com), PE, is a senior engineer with the firm.